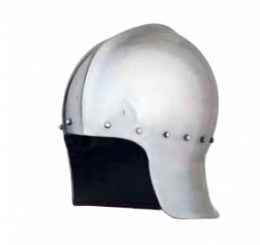 This helmet is of the type known as an archer's helm. This shape was commonly seen during the Wars of the Roses in England from 1455 to 1485. The rounded top and flared neck guard provided protection from missiles coming from above, while the wide face opening allowed for the unimpeded vision necessary for an accurate aim. This premium helmet features an attached liner and chin-strap in natural leather. Reproduced in steel, it is fully wearable by most adults. The Primus range represents the pinnacle of Deepeeka quality historical replicas. Each item of this signature line is developed from original design patterns in consultation with the museum staff with direct access to the original pieces. Additional production development is done with assistance from American and European experts in the field. Only then are these pieces painstakingly created by the finest of Deepeeka’s skilled craftsman. Final quality control is double checked to insure the strictest adherence to even the slightest of details. Deepeeka Exports is extremely proud and pleased to offer the Primus line as the culmination of years of continuing dedication to quality and historical accuracy in these fine products. 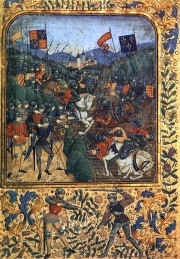 The Wars of the Roses were a series of dynastic civil wars for the throne of England fought between supporters of two rival branches of the royal House of Plantagenet: the houses of Lancaster and York (the "red" and the "white" rose, respectively). 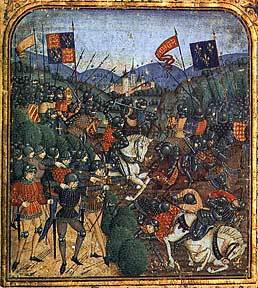 They were fought in several sporadic episodes between 1455 and 1485, although there was related fighting both before and after this period. Many examples of this type of helmet have survived and are on display in museums. This helmet can also be seen in many paintings and manuscripts from the period. This particular helmet is based on an original that currently resides in the collection of the museum in The Royal Armouries Leeds, UK. Hermann Historica Auction number 65, Lot number 58 shows a similar helmet from the same timeframe. This page was last modified on 30 May 2014, at 19:21.